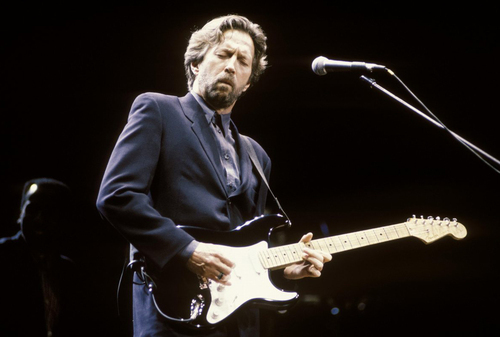 The debate rages as to whether God – aka Eric Clapton, who was tagged as the guitar deity in the mid-1960s in the U.K. – was best in his Cream and not long after Derek and the Dominos days of wine and roses (and, sadly, smack) or in the post-Crossroads era, when a cleaned-up E.C. hosted numerous classic rock icons at his ongoing benefit concert series for sobriety. It’s a fierce debate and no conclusions may be drawn. We leave it up to you to view and hear these classic cuts and decide for yourself. But one conclusion that can be made from these 10 stunning performances is that when he’s up onstage with his talented peers and heroes, Eric seizes the moment and shines. Pete Townshend and some of Eric’s concerned friends like Ronnie Wood, Jim Capaldi, Ric Grech and Steve Winwood got together to impose a rock ‘n’ roll intervention on Clapton by getting him to this concert at London’s Rainbow Theatre in 1973, and out of his heroin-induced stupor. The guitar god was in the habit of indulging his habit and getting lost in the void, so Townshend decided to be his savior. The music bears it out – Clapton was on the money on this night as they performed this Jimi Hendrix classic. Eric Clapton and Carlos Santana got together for this 1975 jam recorded live at the L.A. Forum. No video exists, but a clean version is on Eric Clapton Crossroads 2, a four-CD set of unissued E.C., mostly unreleased live recordings from 1974 to 1978 (and five remixed tracks from E.C. Was Here). With their distinctive styles, it’s fairly easy to tell which is which, and the chemistry in the near 25 minute jam is pepper-packed salsa hot. This video is the entire 1988 Tokyo concert, but the lead-off is a righteous take on Robert Johnson’s “Crossroads,” and then it segues into “White Room,” with Nathan East crooning the falsetto. Clapton is ever the assured performer, meshing well with his guitar-wielding foil Knopfler, and backed by fellow superstars Elton John and Phil Collins. Chalk up one for the post-Cream crowd. There’s all kinds of things wrong or out place about this video. For one, the camera crew were in a stupor, apparently, but thank god they did capture a very rare and exuberant performance by Clapton (on a Telecaster with a Stratocaster neck) and his Faithmates – Winwood at the top of his game, Ric Grech and Ginger Baker in Hyde Park in 1969. Clapton thought the band’s playing was sub-par and that the adulation was undeserved and reminiscent of his Cream days when the crowds would applaud for nearly everything. The crowd in this debut performance of the supergroup lapped it up. Fast forward 40 years. Clapton and Winwood took on “Can’t Find My Way Home” again – with Doyle Bramhall II and Derek Trucks for good measure – during the second Crossroads Guitar Festival held at the Toyota Park Center in Chicago, where the duo performed a number of Blind Faith songs as part of their set and again at three reunion concerts at Madison Square Garden that took place in February 2008. They did it again here in 2009, with a backing band similar to the one at Madison Square Garden, with Ian Thomas replaced by Abe Laboriel Jr. and backing vocalists Michelle John and Sharon White added. They really smoke in this clip with superior camera work and sound. Clapton wrote “Old Love” with American bluesman Robert Cray, a dynamic young bearer of the Clapton mantle. The two Stratmongers get down halfway through this cut, as Cray takes off on a flight that is answered by Clapton’s deft picking in the high register. The three young guitar turks sit down at the feet of the master when they play on this Crossroads Guitar Festival from the concert at Toyota Park in Chicago in 2010. Off camera, Ronnie Wood sits watching in awe. And well he should. Every one of these guys is playing his heart out. Then, Wood, Buddy Guy, Johnny Lang and Johnny Winter come up on stage and cut loose. Clapton is absolutely inspired on this burn-up with Blackie, his steady Stratocaster. With his mentor B.B. on the famed and magical Apollo Theater stage, not only savage licks but playful ones come out. Beck, Collins and Guy join them on the second song, “Sweet Little Angel.” Collins is especially effective, but make no mistake, this is world-caliber, top-level bluesmanship. They round it out with “Let the Good Times Roll” and even more superstars grace the stage. Beck joins E.C. on the song, “Cause We’ve Ended As Lovers,” written by Stevie Wonder and given to Beck for his use on the instrumental album Blow By Blow. The song was dedicated by Beck to the late Roy Buchanan. Lennon, E.C., Keith Richards and Mitch Mitchell – though, alas there is no Hendrix – formed the alfresco “Dirty Mac” group comically introduced by Lennon and Mick Jagger in this priceless bit of rock history from the legendary Rolling Stones Rock and Roll Circus in 1968. They wail out on Lennon’s “Yer Blues.” We get that he is lonely and wants to die. How come you didn’t include any of his work with Duane Allman. What a joke your list is. His best work was with Allman and no one cannot deny that!!! Moron!!! If I had to guess, and this is just a guess, I’d say the reason there’s no material that included Allman, is because they couldn’t find any video to go along with the music. BCB usually know their stuff, to leave out any mention of Duane Allman when talking about Clapton collaborations, they would have to have a pretty good reason. But, as I stated above, that is just a guess. Why did you not include Duane Allman in your list? His BEST work was with Allman…You moron!!!!!!!!!! SheFox is absolutely accurate. Clapton and Allman will stand 100’s of years from now. No “Sign Language” with Bob Dylan? Have your ears checked…. No collabs with Harrison – his main guy!???! What about his work with the Band – better then half the crap listed here. ..And didn’t he do some great guitar work on the Beatles double album (While my guitar gently weeps)????? What? and No George Harrison & Clapton from their “Live In Japan” concerts? Pitiful selections here.